The Motorola RAZR V3 is now available in the UK. Carphone Warehouse is selling the highly sought after device for as low as �49.99 (about $90 US) with a new activation from O2. You can also purchase the RAZR V3 with an activation from Vodafone, but pricing starts at �129.99. The Motorola RAZR V3 has gotten a lot of attention thanks to its design--it is just 14MM thick. 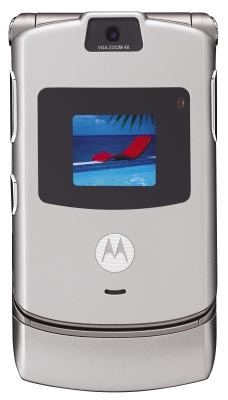 Other features include: * VGA Camera * Bluetooth * Video playback * 176x220 262K color display * 95g The Motorola RAZR V3 is expected to become available in the US at a later date. 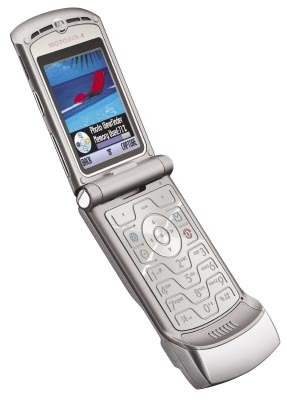 We have received a large number of questions regarding what carriers would possibly carry the RAZR--at this time it looks like Cingular will though other carriers may very well jump on. More pictures are available after the jump. Click on thumbnail at right to view full size.